Preventing runoff in equipment wash areas from directly or indirectly reaching surface waters, drain pipes, or storm sewers is an important BMP, as washwater can contain organic material, such as grass clipping and soil, as well as soaps, oil residue, fertilizer, and pesticide residue. In addition, minimizing the use of detergents and using only biodegradable non-phosphate detergents is a BMP. 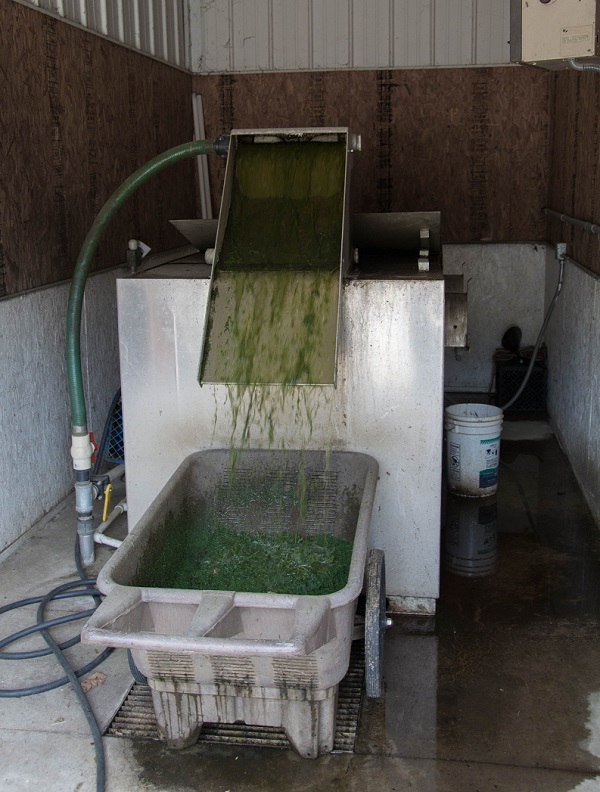 For equipment other than any with potential pesticide residue, the primary concerns related to washwater are the nutrients (nitrogen and phosphorus) associated with the clippings. 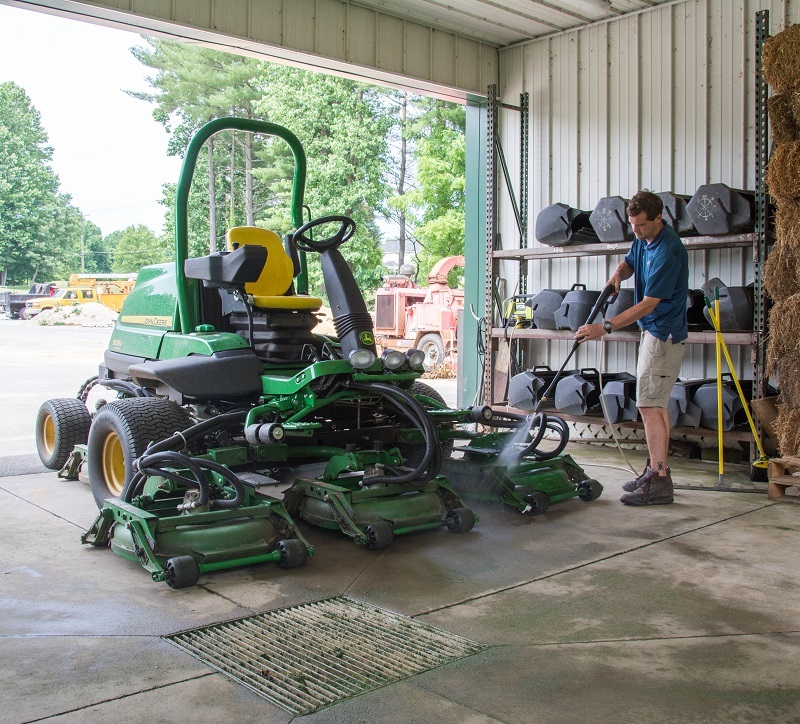 To reduce the amount of organic debris in washwater, grass clippings should be blown off equipment with compressed air instead of, or prior to, washing with water. In the wash area, a catch basin to collect remaining grass clippings should be installed and maintained. Clippings can be cleaned up and then composted or removed to a designated debris area. When formal washing areas are not available, a “dog leash” system using a short, portable hose to wash off the grass at random locations may be an option. However, these locations should not be near surface waters or storm drains. For equipment that may have pesticide residue, BMPs should be followed to ensure that washwater does not become a non-point source of pollution. Captured washwater can be used as a dilute pesticide per label, or it may be pumped into a rinsate storage tank for use in the next application and used as a dilute pesticide per label. Brush or blow off with compressed air grass-covered equipment before washing. Consider the use of a closed-loop washwater recycling system. Equipment washing areas should drain to an oil/water separator before draining to a sanitary sewer or holding tank. Avoid washing any equipment in the vicinity of wells or surface waterbodies. Wash equipment over a concrete or asphalt pad that allows the water to be collected. After the residue dries on the pad, collect, compost, or spread on turf. Minimize the amount of water used to clean equipment. This can be done by using spray nozzles that generate high-pressure streams of water at low volumes. Minimize the use of detergents and use only biodegradable non-phosphate detergents. Use non-containment washwater for field irrigation. Do not discharge non-contaminated wastewater during or immediately after a rainstorm, since the added flow may cause the permitted storage volume of the stormwater system to be exceeded. Do not discharge washwater to surface water or groundwater either directly or indirectly through ditches, storm drains, or canals. Never discharge to a sanitary sewer system without written permission from the utility. Never discharge to a septic tank. Do not wash equipment used to apply pesticides on pads with oil/water separators. Do not wash equipment on a pesticide mixing and loading pad. This keeps grass clippings and other debris from becoming contaminated with pesticides. Solvents and degreasers should be used over a collection basin or pad that collects all used material. Equipment washing at Baltimore Country Club. Photo credit: Mark Jones. 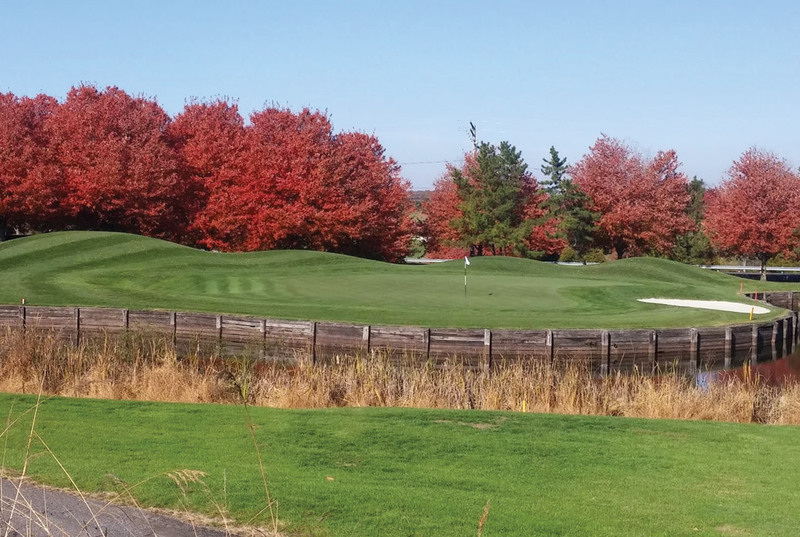 Clippings should be separated from washwater and managed properly to avoid water quality impacts from nitrogen and phosphorus. Photo credit: Mark Jones. 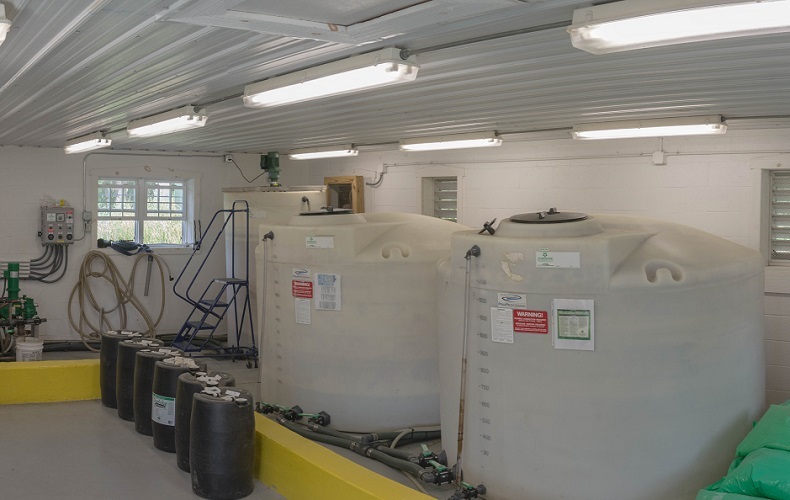 Closed loop washwater recycling system at Baltimore Country Club. Photo credit: Mark Jones.